The 2014 Nuclear Security Summit is currently being held in The Hague. The ongoing crisis in Crimea has diluted the world's attention on the nuclear issue and this summit has been viewed as an opportunity for US President Barack Obama to form alliances to isolate Russia. The notion of a new Cold War has been the subject of speculation by the international media. Russian President Vladimir Putin simply didn't go to The Hague and sent Foreign Minister Sergey Lavrov instead. As Obama accelerates his sanctions on Moscow, Putin has carried out counterstrikes. One can sense the beginnings of a Cold War in Europe. The confrontation between the West and Russia displays the highest point of friction among big powers since the 1990s. A worst-case scenario will not be another version of the prolonged Cold War between the US and the Soviet Union. The reason is simple: Russia does not boast the national strength of the Soviet Union and it has no camp with it to confront the West. The crisis in Crimea is more like an eruption, as the Russians could no longer bear the West's squeeze from the past 20 years. Western leaders apparently misjudged the nature of the counterstrikes led by Putin, leading to bewilderment in the West. Western leaders were in turn prompted to take a tough stance toward Putin. A new Cold War is on the verge of breaking out. In a mitigated manner, the Crimea crisis indicates the deepest divergence and hostility between Russia and the West. As long as Putin still leads Russia, the best status for the two sides is one of mutual tolerance. If Obama takes the long-term view, he should stop overpowering Russia, which will only bring chaos to Europe. If Obama wants to return to the past glory of the Cold War and contain Russia, the US' global strategies will have to be rearranged, while Washington can hardly be that determined. The West and Russia should give each other a chance to extricate themselves from the current dilemma. Russia has no power to overturn European order, and the US will not bring about a new Cold War. Compromise is the best approach. Whether Obama, a Nobel Peace Prize winner, can acknowledge the significance of US restraint toward world peace will determine how competition among world powers enters the next phase. If the confrontation between the US and Russia spirals out of control, China will face more uncertainties, which does not suit its interests. The distrust between Russia and the West makes Moscow value its relations with Beijing. But if a new Cold War breaks out, the situation will evolve differently. 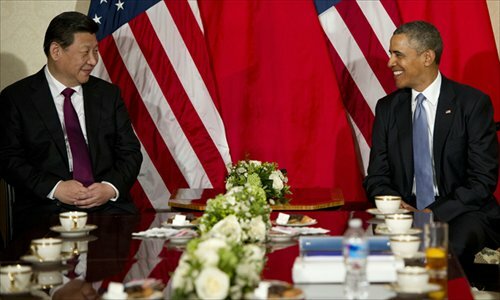 China is not a small country that can survive in confrontations among big powers. Europe weighs heavily in China's strategies and its stability is vital for China. Although Moscow is a provocateur in the eyes of the West, the latter holds the biggest right in the international political stage, thus it shoulders the primary responsibility for the world's peace and stability.